Christ Church is a grand and rather surprising church in the working class Victorian and Edwardian suburbs to the north of Norwich city centre. It predates the housing around it. The west frontage is pre-ecclesiological, but intricate, as if rather more than just the enthusiasm of some 1830s local Gothick carpenter. 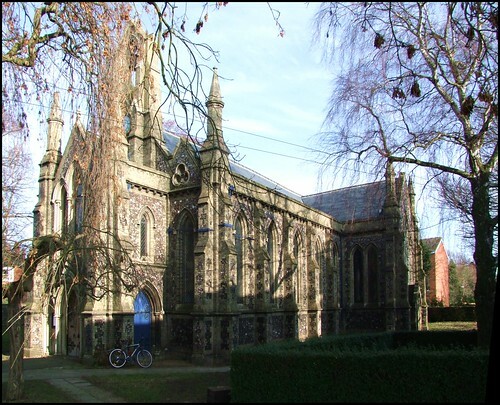 In fact, it is the 1842 work of John Brown, who in the 1830s and 1840s was designing high quality Commissioners churches for the Diocese, and thus was one of the first Victorian churches in Norfolk. Here is a mature architect working without the constraints of the pattern books of the Camden Society and the imperatives of the Oxford Movement. Christ Church was his first project after Hainford All Saints, a few miles off. The design is very similar, except that here gault brick was used instead of red brick and flint. Early English the style might be, but those spirelets lift the eye to heaven as surely as any Perpendicular architecture. This is a church which appears larger inside than it does outside. You step through the west porch into a pleasingly light interior which is a lovely example of the decade. Pevsner describes a poor timber roof, but this is most unfair: Brown created an elaborate, airy roof structure which has in recent years been returned to what were probably its original colours. A south transept with a delicious late Arts and Crafts window forms the parish war memorial, with a staggering number of names. This has become an area for quiet prayer in a church which is open every day, a valuable resource in an inner-city suburb - other churches might well follow the example. Old photographs of the interior show an altar hard against the east wall, hemmed in by altar rails, with choir stalls cluttering the chancel aisles. But these are gone today: the altar stands west of the last bays of the arcades, and looks as if it was always intended to be there. Thus, liturgical reforms have brought about a harmony not intended by the architect. Curiously, the older photographs also show that, since the 1960s, the original benches have been replaced by the current range, painted the same soft green as the roof and walls.It would be interesting to know where they came from. Christ Church was built at a time when Norwich was just beginning to stretch its wings as an industrial city. Overlooking all from the west are the Victorian royal arms, installed for a young monarch in her early twenties, at an optimistic moment when anything must have seemed possible.